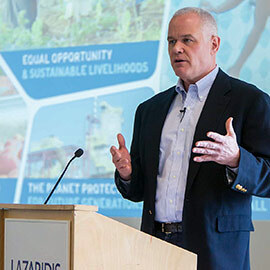 John LeBoutillier, Lazaridis School of Business and Economic’s latest CEO-in-Residence and Unilever’s CEO and president, posed the question, "Can you do well by doing good?" to a captive audience of more than 260 students, professors and staff in February. “People want to go to a job that’s meaningful,” said LeBoutillier. He provided many examples of Unilever brands that have a defined social mission to create more meaning in places of need. One example is Dove’s self-esteem project, which aims to help girls overcome beauty related pressures and realize their potential. “These are issues young women are dealing with globally,” said LeBoutillier. LeBoutillier discussed the importance of sustainability, considering a product’s impact from production to disposal, and achieving a triple bottom line – people, planet and profit. Uniliver has developed a Sustainable Living Plan, sharing their goals and outcomes freely in the hopes others will join or improve on them. After the keynote, Unilever hosted a U-Connect networking fair for all Laurier students, complete with free samples and giveaways of popular Unilever brands like Ben & Jerry’s ice cream, Axe body spray and TRESemmé hair products. A number of Unilever Canada staff, who are Laurier graduates, were on hand to talk about career opportunities with the company.